I’VE been wracking my brain for a killer best-seller to earn me tons of money, but a survival guide for Gibraltarians going to British universities is one I never thought of. I mean, they’re not going to Outer Mongolia. They speak English in Britain! And, as Gibraltarians proudly tell the world at every opportunity, so that even Outer Mongolians probably know it, they are British. Nevertheless, it’s one hell of a niche market, as discovered by Gibraltarian post-graduate Philip Vazquez, who’s been to Cardiff, done the graduation ceremony and got the law degree. Before he even published it, news of Youniversity,Gibraltar’s Guide to Studying at University, and its companion website, was spreading across the social networks and into the Olive Press. Some 900 Gibraltarians go to British universities each year, and will continue to do so (even though Gibraltar now has its own university). Philip and his team of contributors have got it made! Jealous, moi? Maybe just a tad, but mortar boards off to him. My question is, why? You would have thought Gibraltarians would feel right at home on the soil of their sovereign motherland – particularly in Cardiff where (imho) the Welsh lilt doesn’t sound far off the Gibraltarian English accent. Ketchup from Tesco must taste much the same as it does from Morrisons, and they can pay for it in pounds and pence, just like they do at home. Yet according to Philip, they do worry … about flying and travelling by tube (which they should be used to with all their underground tunnels) and managing their money. Although with 100% government scholarships and an annual maintenance grant, the poor wee lambs could probably afford to hire their own accountants. They also worry about not being able to cook, as their mums and grans have always done it for them. The family’s still nuclear-powered in Gib! Of course, they can always pack a copy of Justin Bautista’s best-seller, based on his grandma Mamma Lottie’s recipes, which he cooked up at university to stave off homesickness. The book has become a bestseller locally, with huge support from the government, which put it forward for a prestigious Gourmand Award. Young Gibraltarians have got jam on it … financing all the way from uni fresher to PhD, with great work experience opportunities out of term back home and, in all likelihood, jobs at the end of it. Speaking as an ex-student who worked in a scary bar in Fratton at the rough end of Portsmouth to pay for journalist college and unsavoury ‘digs’ run by an unspeakable landlady, I find myself turning an envious tinge of green. However, according to Philip’s survey, students’ greatest fear is being alone in a strange city, away from family and friends. They miss the shelter of a Rock where the sun usually shines, where people leave their doors unlocked and look out for each other like family (which they often are); they miss having nowhere to buy tomate frito! 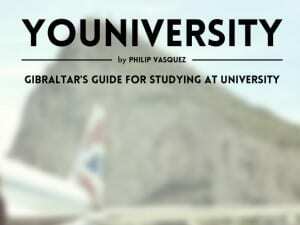 Maybe Gibraltar’s homesick freshers need a Youniversity survival guide after all. I’m just sick I didn’t think of it first!